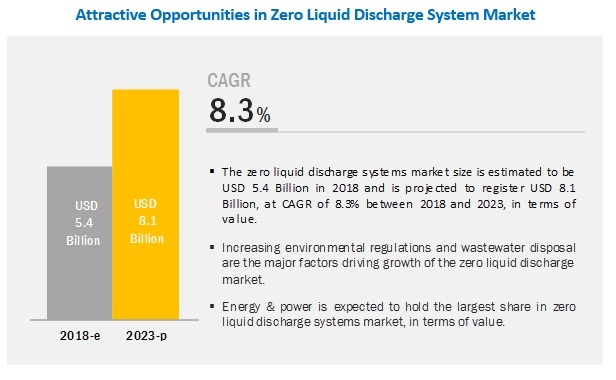 [144 Pages Report] The zero liquid discharge systems market is estimated to be USD 5.4 billion in 2018 and is projected to reach USD 8.1 billion by 2023, at a CAGR of 8.3% from 2018 to 2023. Rising concerns over the disposal of brine concentrates into water bodies is expected to drive the zero liquid discharge systems market. Growing demand from the South America region from end-use industries such as energy & power is also expected to fuel the demand for zero liquid discharge systems. By system, the conventional segment is expected to lead the zero liquid discharge systems market during the forecast period. By end-use industry, the energy & power segment is expected to lead the zero liquid discharge systems market during the forecast period. Based on end-use industry, the energy & power segment led the zero liquid discharge systems market in 2018, owing to regulations prohibiting the discharge of concentrated effluents in water streams. Demand for fresh water and the implementation of stringent environmental regulations across the globe are driving the demand for zero liquid discharge systems. North America is expected to lead the zero liquid discharge market during the forecast period. The North American region is estimated to lead the zero liquid discharge systems market in 2018 and is expected to grow at a high rate during the forecast period, owing to the increasing demand for these systems from the US, Canada, and Mexico. High demand from end-use industries such as energy & power, chemicals & petrochemicals, and food & beverages is driving the growth of the zero liquid discharge systems market in these countries. Companies such as Aquatech International LLC (U.S.), SUEZ water technologies & solutions (U.S.), Veolia Water Technologies (France), GEA Group (Germany), Praj Industries Ltd. (India), H2O GmbH (Germany), U.S. Water Services (U.S.), Aquarion AG (Switzerland), Doosan Hydro Technology LLC (U.S.), Petro Sep Corporation (Canada), and Saltworks Technologies Inc. (Canada), among others are the major players in the zero liquid discharge systems market. These players have been focusing on developmental strategies such as contracts, mergers & acquisitions, expansions, and divestments which have helped them to expand their businesses in untapped and potential markets. They have also been adopting various organic and inorganic growth strategies, such as new product developments, acquisitions, and expansions, to enhance their current position in the zero liquid discharge systems market. In November 2018, Veolia Water Technologies established a new plant, AQUAVISTA, which is a holistic digital solution composed of a suite of intelligent software solutions for real-time optimization of process performance. It provides an auto-pilot mechanism for the optimization of the entire wastewater system, including sewer networks and treatment plants. This expansion helped Veolia Water Technologies expand its geographical presence and product portfolio in the zero liquid discharge systems market. In May 2017, Praj Industries Ltd. expanded its business by establishing a new smart bio-refinery for renewable fuels & chemicals. It is a breakthrough in the company’s proprietary platform technology, enfinity, for the manufacture of ethanol from agri-waste. The agri-residues may include rice and wheat straw, cotton stalk, bagasse, cane trash, corn cobs & stover, etc. which are e converted to ethanol, with superior product yields. It is an energy-efficient process equipped with the zero liquid discharge system. In March 2017, Suez Environment (France) agreed to acquire the water treatment unit of GE Water & Process Technologies for USD 3.4 billion. The acquisition enhanced Suez’s product portfolio in treatment chemicals and membranes. The strategy will disconnect GE Water from the zero liquid discharge business, but it is expected to strengthen the market position of Suez in industrial water treatment. What are the future revenue pockets in the zero liquid discharge systems market? Which key developments are expected to have a long-term impact on the zero liquid discharge systems market? Which products, equipment, and processes are expected to cannibalize existing markets? What will be the future product mix of the zero liquid discharge systems market? What are the prime strategies of leaders in the zero liquid discharge systems market? 12.7 U.S. Water Services, Inc.
12.12.12 Tamilnadu Water Investment Co. Ltd.
12.12.13 Transparent Energy Systems Pvt. Ltd.
12.12.14 ZLD Technologies Pvt. Ltd. The study involved four major activities to estimate the current market size for zero liquid discharge systems. Exhaustive secondary research was carried out to collect information on the market, peer markets, and the parent market. The next step was to validate the findings collected from secondary sources, assumptions, and sizing with industry experts across the value chain through primary research. Both the top-down and bottom-up approaches were employed to estimate the complete market size. Thereafter, the market breakdown and data triangulation procedures were used to estimate the market size of segments and subsegments. In the secondary research process, sources such as D&B Hoovers, Bloomberg BusinessWeek, and Dun & Bradstreet, were referred to for identifying and collecting information for this study. Other secondary sources include annual reports, press releases & investor presentations of companies, whitepapers, certified publications, articles by recognized authors, gold standard & silver standard websites, associations, regulatory bodies, trade directories, and databases. 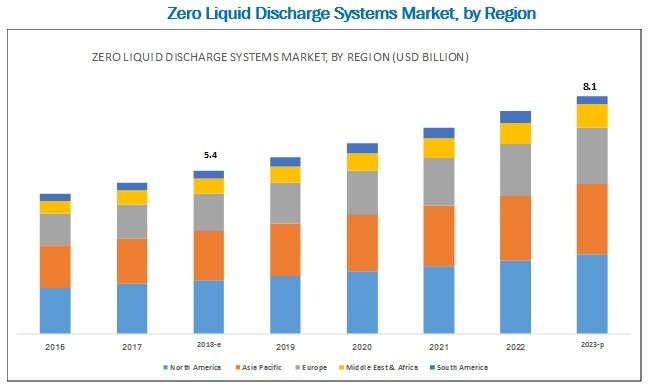 The zero liquid discharge systems market comprises stakeholders such as raw material suppliers, end product manufacturers, and regulatory organizations in the supply chain. 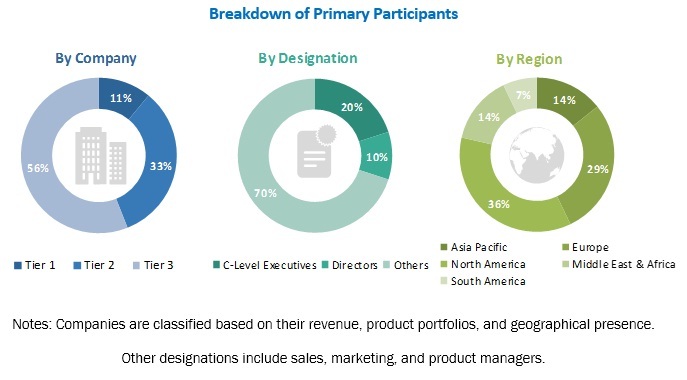 The demand side of this market is characterized by developments in the energy & power, chemicals & petrochemicals, foods & beverages, textile, pharmaceuticals, semiconductors & electronics, and other end-use industries. The supply side is characterized by market consolidation activities undertaken by zero liquid discharge system manufacturers. Several primary sources from both, the supply and demand sides of the market were interviewed to obtain qualitative and quantitative information. Following is the breakdown of primary respondents. After arriving at the overall market size-using the market size estimation process explained above-the market was split into several segments and subsegments. In order to complete the overall market engineering process and arrive at the exact statistics of each market segment and subsegment, the data triangulation and market breakdown procedures were employed, wherever applicable. The data was triangulated by studying various factors and trends from both, the demand and supply sides. Aquatech International LLC (US), SUEZ Water Technologies & Solutions (US), Veolia Water Technologies (France), GEA Group (Germany), Praj Industries Ltd. (India), H2O GmbH (Germany), US Water Services (US), Aquarion AG (Switzerland), Doosan Hydro Technology LLC (US), Petro Sep Corporation (Canada), IDE Technologies (Israel), Degremont Technologies Ltd. (Switzerland), Oasys Water, Inc. (US), and Saltworks Technologies Inc. (Canada), among others. Total 25 major players covered. This report categorizes the zero liquid discharge systems market based on system, process, end-use industry, and region.